Twenty years ago in the Isan region of Thailand, near the killing fields of Laos and Cambodia, I noticed that the tapered cylinders of temple bells in every wat appeared to be made from bombs. During the 1960s and ’70s, massive bombing raids on Vietnam and Laos had been launched from secret U.S. air bases in this part of Thailand. At the war’s end, when the U.S. withdrew from Southeast Asia, large stockpiles of weapons were left behind. In the Hebrew Scriptures, the prophet Isaiah says, “and they shall beat their swords into ploughshares.” Ingenious people of Thailand converted bombs into temple bells, calling Buddhist monks, nuns and laypeople to practice a way of peace. 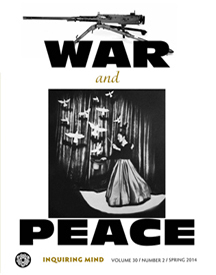 This issue of Inquiring Mind is about war and peace. In idealistic moments I like to imagine that peace is the abode and resting place of humankind, the place one naturally inhabits when all conflicts melt away. In the give-and-take of real life, conflicts between people are inevitable. Conflict is, in fact, the precondition for peace; it is how we truly learn about each other, our difference and sameness. When conflict and acrimony overwhelm nations, war is too often the result. Throughout history, war has brought upon us unbounded violence and destruction that transcends reason: from Homer’s epic age, to the intertribal slaughter of Buddha’s time, down to battles and terrors that today pervade our media and fill us with dread for ourselves and our children. The aftermath of nonviolence is the creation of the beloved community, so that when the battle is over, a new relationship comes into being between the oppressed and the oppressor. As editors of this issue, Barbara Gates and I have tried to give voice to multiple points of view: the way of the warrior, the path of nonviolence, the voice of protests, and the grief of those left behind. Those voices, based on the lived experience of fellow practitioners, are moving and passionate. Each deserves your attention and thought. And, of course, there are many more that we wish we had space for. Our intention was not to be all-sided in some “value-free” fashion, but to present conflicting views and to encourage you as readers to inquire deeply and reach your own conclusions.